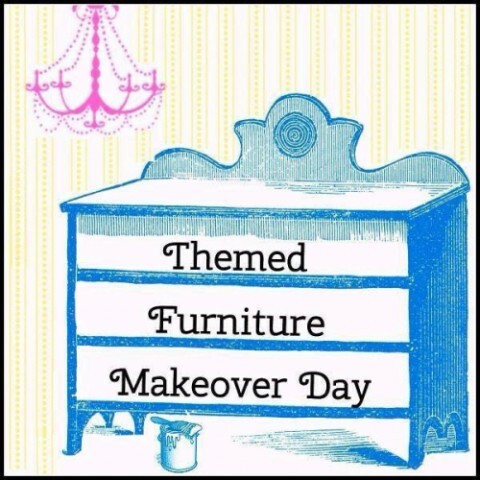 Today is our Themed Furniture Tour! If you’re new to the blog, this is a monthly tour where my blogging buddies and I makeover furniture pieces with a different theme. This month’s theme is small tables. I found this table for free at a yard sale last year. I had no idea what I was going to do with it, but you know that I can’t pass up free, folks. I had it home for a while, and since I had no vision for it, down in the depths of the storage room it went. Since Topher (the hubs) has been after me for a while to thin down my hoard, I pulled this baby out and got to work. It’s kind of an odd size and shape, and the only thing that came to mind was that it would look cute as a bedside table in a little girl’s room. 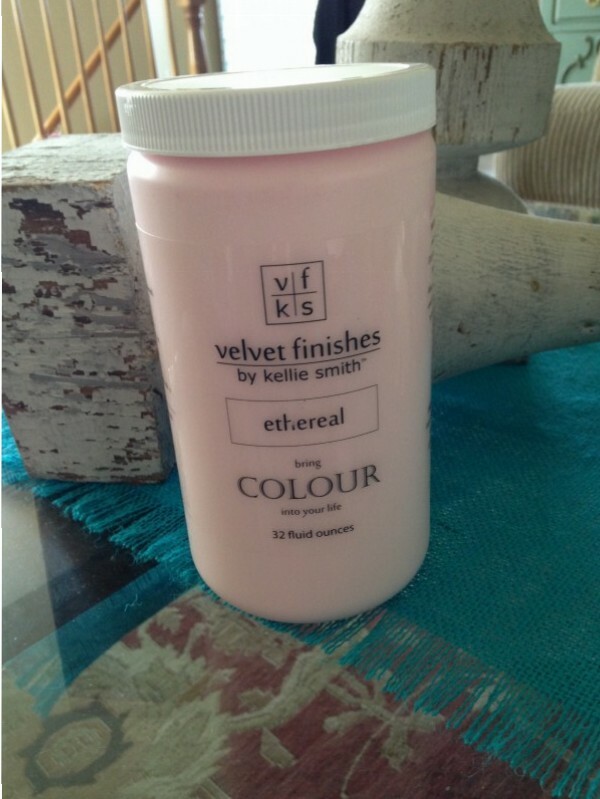 The lovely Kellie from Velvet Finishes sent me some of her paint to try out. 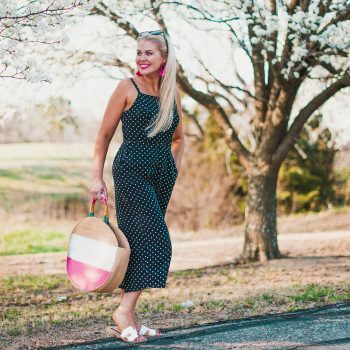 I’m a lover of new products, so of course I was excited to try it. 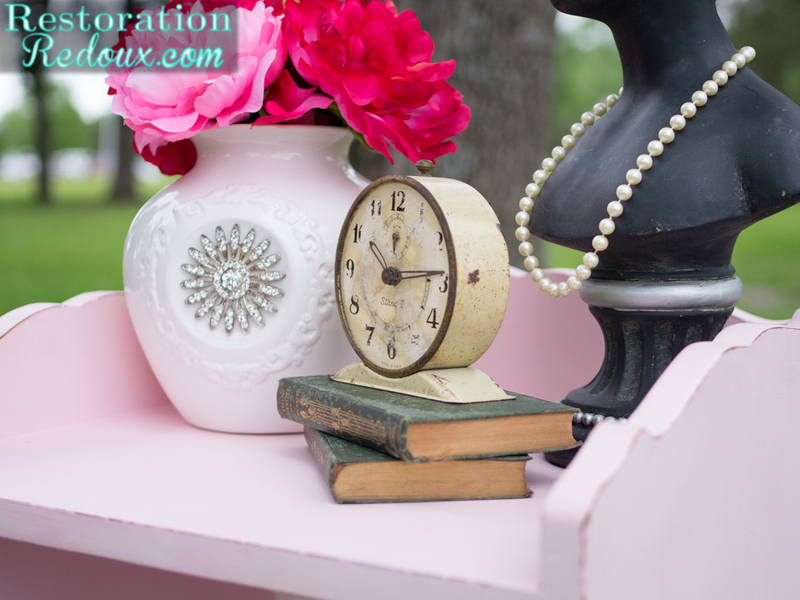 Now if you follow my blog regularly, you will know that I normally use chalkpaint/Plaster Paint on most of my projects. I will tell you right now, this is not like those types of paints. 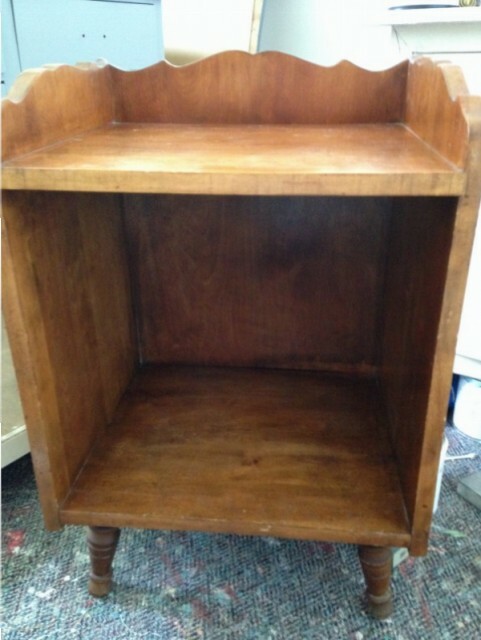 First of all, if the furniture piece you are working on has a sheen to it you, need to prepare the surface with Ready. You simply spray it on and wait for it to dry. Then you are ready to paint! 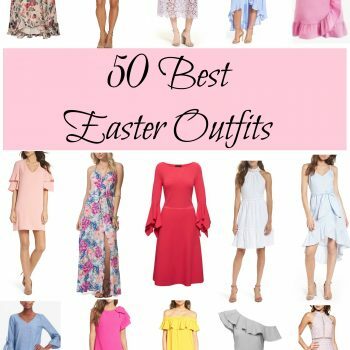 I chose the Ethereal which is a light pink. After painting on two coats of that, I let it dry. 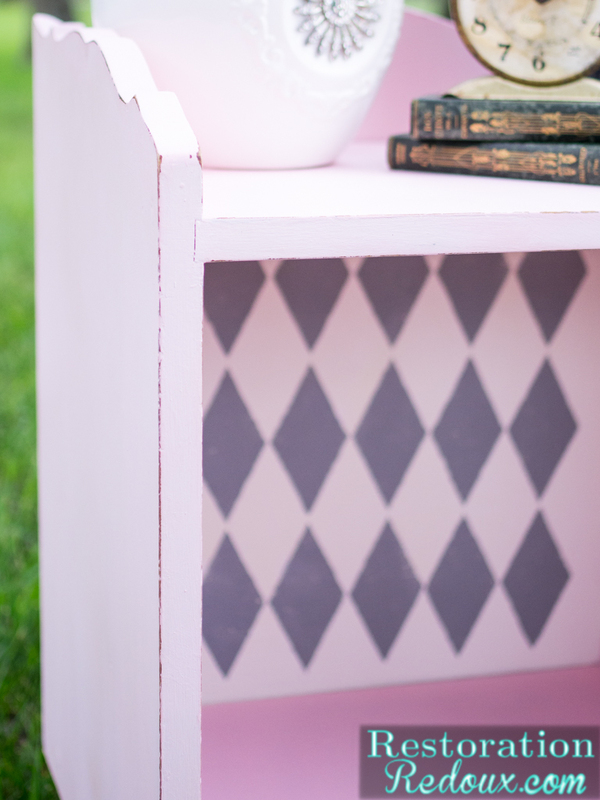 This paint does take a bit longer to dry than chalkpaint, but it does give a very smooth finish with no brush strokes. I then painted the back of the piece in Rococo. Once that was dry, I stenciled on a harlequin pattern using Opulent. I then used a fine grit sanding block and distressed the whole piece. With Velvet Finishes you don’t have to seal your project unless it is a piece that is in a “high traffic” area … so I was finished! 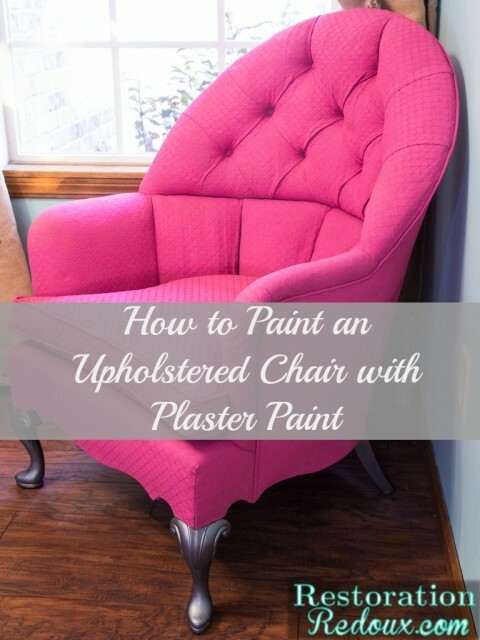 Make sure you head over to see my Pink Plaster Painted Chair! I love Velvet Finishes paint! The finish is so pretty and I love that I don’t have to wax or seal it. 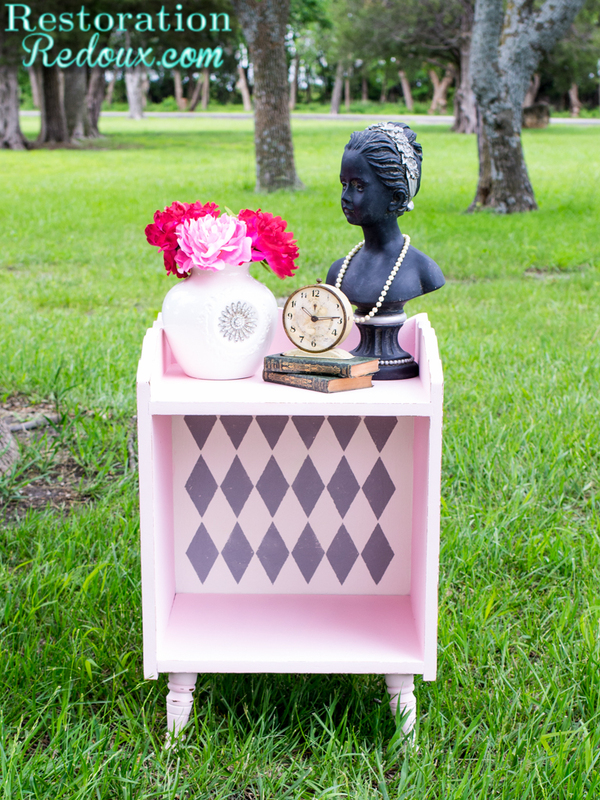 The harlequin pattern is perfect for this piece and I’ll bet that some little girl will soon enjoy it in her room. This is adorable! 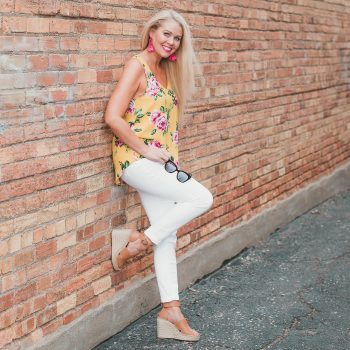 I love your color choices and just everything about this little cutie! Why oh Why can’t I live closer to you so I could buy your items???? You have quite the touch, my friend! 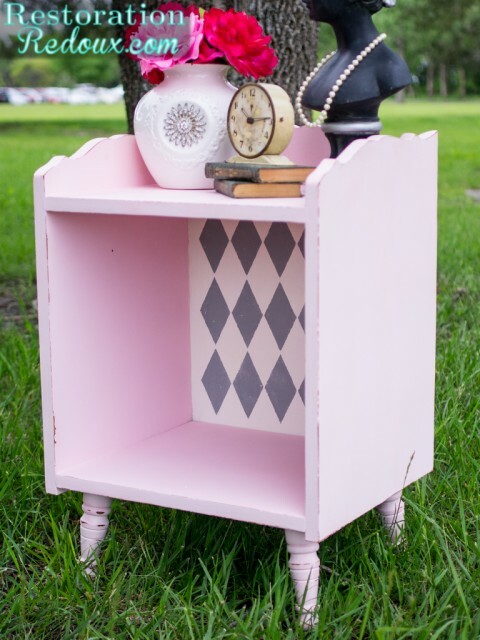 Adorable Shanna – perfect for a young or not so young girl’s room! From boring to BAM!! Great job, Shanna! That is the coolest, funnest table Shanna! 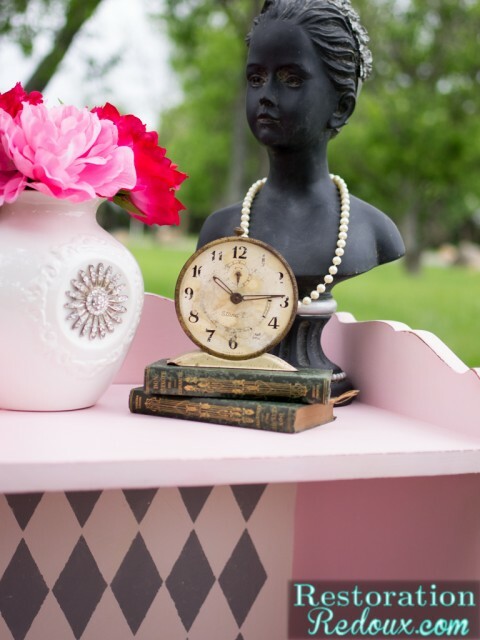 What a neat, neat find and your ‘redoux’ is perfection! 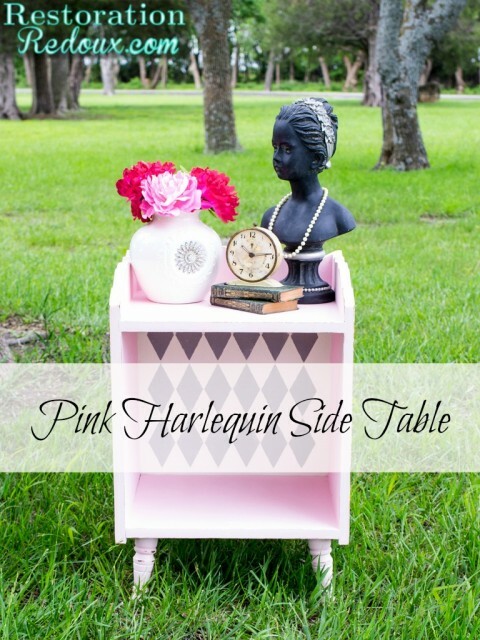 I think the harlequin is the bomb! This turned out so perfect. 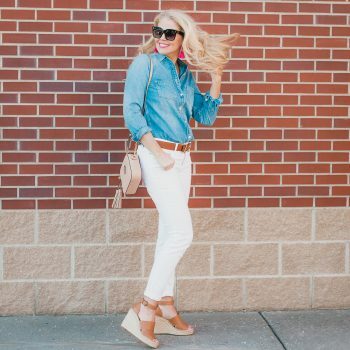 Love the color combination and style! Shanna, What a cute table. I’m not familiar with Velvet finishes. I’ll have to check it out. I love the stencil pattern. Love, love love the way this piece turned out! 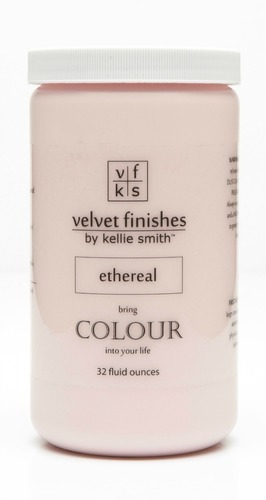 Thanks so much for using Velvet Finishes! !